east fremantle's george street festival 2018 - Job well done! East Fremantle’s George Street Festival embraced local food, art and fashion, with a focus on environmental sustainability – in line with the ethos of the area. The festival in its 29th year, was a huge celebration of our local community and identity, and we very much look forward to 30th anniversary celebrations next year. The Town is overwhelmed by the amount of positive unsolicited feedback received and feel we can say “mission accomplished”. The George Street Festival sprang onto the festival scene in the late 1980s through the cooperation of the George Street traders. The Town of East Fremantle have been facilitating the Festival since the 1990s – this festival is an annual opportunity for a collaboration between local government, traders, community groups and residents to showcase the uniqueness of East Fremantle. 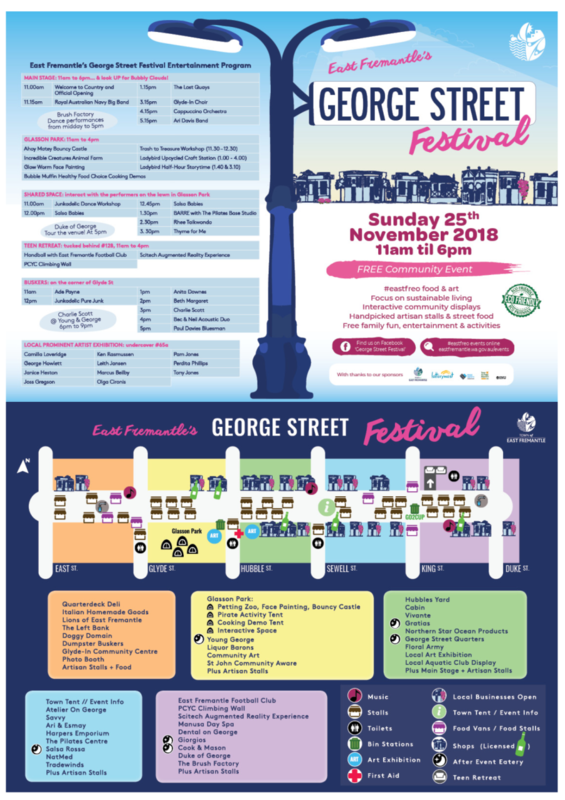 East Fremantle’s George Street Festival celebrates the unfolding story of East Fremantle with local residents and the wider community. In keeping with the ethos of the local community there will be a strong focus on environmental sustainability. Same Street, Different Date! #eastfreo’s established afternoon of artisan fare is moving. George Street again hosts this popular event, but it’s a week early, slipping into the last weekend of Spring. Artisan Stalls – accessories, clothing, craft, gourmet food, health & wellbeing, homewares and jewellery. Free Entertainment & Activities – music on the main stage, busking along the street, roving street artists, sustainability support, healthy living demonstrations and the #eastfreo festival themed photo booth. Especially for the Kids – the classics… baby animal farm, bouncy castles, face painting plus healthy cooking demonstrations, community treasure hunt and upcycled craft. East Fremantle’s iconic George Street will provide a stunning backdrop for all elements of the festival. *Artisan - made in a traditional or non-mechanized way using high-quality ingredients / materials. Products that are imported / made overseas / purchased from a wholesaler are deemed inappropriate for this event. eco-friendly, noting that this is a waste-wise event and a disposable plastic bag free zone.